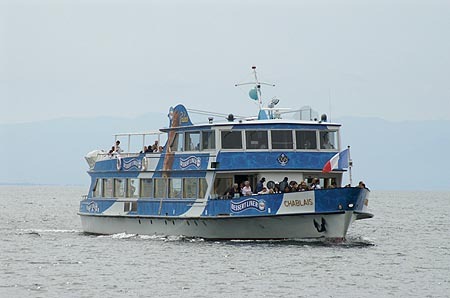 This page is one of a series devoted to postcards and photographs of the Compagnie Générale de Navigation sur le lac Léman (CGN). This page shows the operational 2005 fleet in photographs taken during July 2005 by Ian Boyle. An alphabetical list of ships shown on this page is shown below. Below this is the 2005 Fleet List in chronological order. There is a table of individual ship histories on the CGN Header Page. 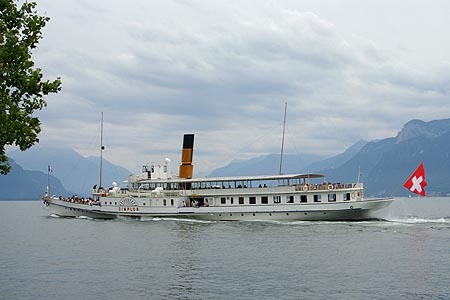 The significant event of 2005 was the return to service of in Simplon (3) July. 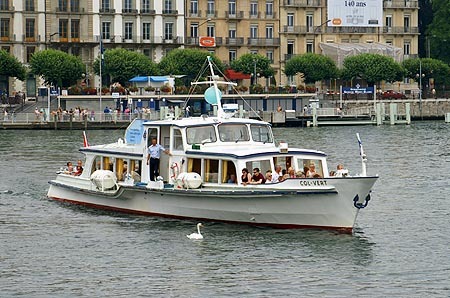 After introductory cruises on 2nd/3rd July, she took up the two-day roster on Sunday 17th July, shared with the Rhône (3). The depressing news was that Italie was to be withdrawn at the end of the 2005 season, followed by Vevey in 2006 after the return of Savoie. My thanks to Pascal Pouillot (CGN) for his assistence with this page. CGN - Page 5 - The 2005 Fleet - this page! 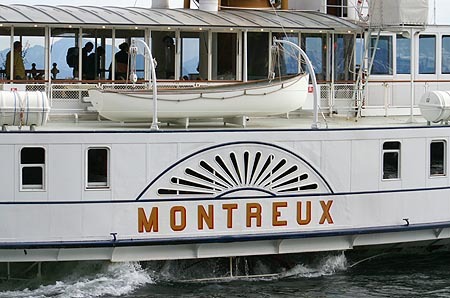 Montreux are was built in 1904 by Sulzer Brothers of Winterthur. She is 60 metres long and was fitted with a 2-cylinder compound engine of 1000hp, built by Sulzer. In 1962 she was fitted with an 8-cylinder diesel-electric installation of 1100hp, following boiler problems from 1958. She returned to service with a small white motorship funnel. In the winter of 1978-79, Montreux received major hull and superstructure repairs. 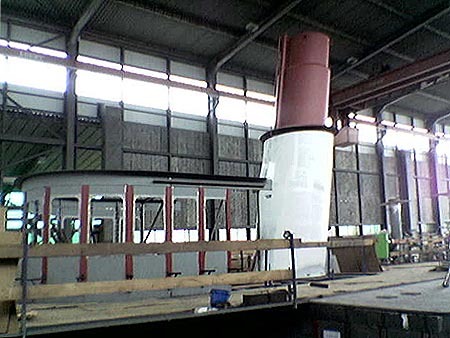 In 1986, she reverted to a more traditional funnel, although it remained white. The diesel engine and generator equipment received a major service in 1989. 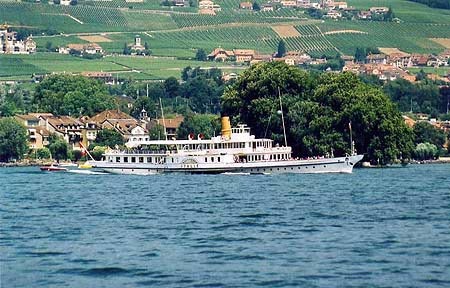 In 2001 Montreux received a new 2-cylinder simple engine, and her accommodation was substantially rebuilt, incorporating the dining saloon panelling of the Valais, which had acted as a restaurant ship at Geneva since 1966 (Valais was then scrapped in 2003). The rebuilt accommodation is to a luxurious standard, and Montreux initially ran fairly limited "gastronomic cruises" in association with the Beau-Rivage Palace Hotel in Ouchy. 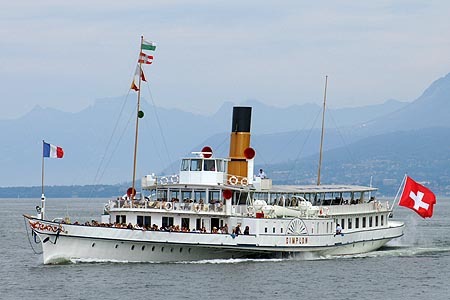 However, the unavailability of two major units of the fleet in 2004 (Savoie being rebuilt, and Simplon (3) receiving repairs following her boiler explosion), required that Montreux also took the afternoon Tour du Haut-Lac in the peak season, which leaves Ouchy at 14:15hrs for Evian, St Gingolph, Montreux and Vevey, returning to Ouchy at 18:10hrs. 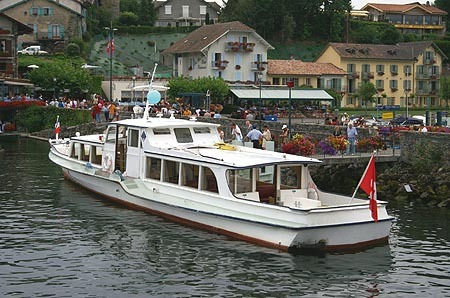 This is preceded by a lunch cruise to Evian between 12:30hrs and 13:55hrs. 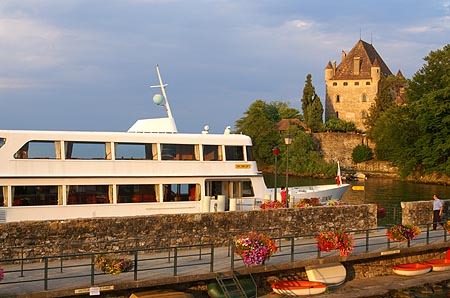 In the evenings she operates an evening dinner cruise to Yvoire via Morges and Rolle at 18:35hrs, returning at 22:07hrs. 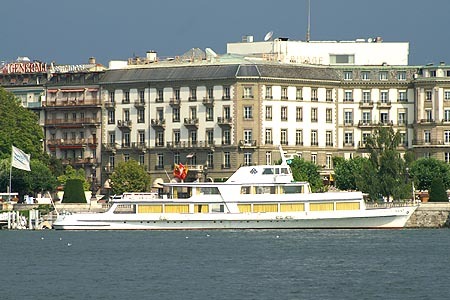 She connects at Yvoire with the evening cruise from Geneva, run by Vevey in 2005, providing the possibilty of late journeys between Geneva and Lausanne (or vice versa). Her itinerary (but with less frequent evening cruises) had previously been carried out for many years by the La Suisse (2). 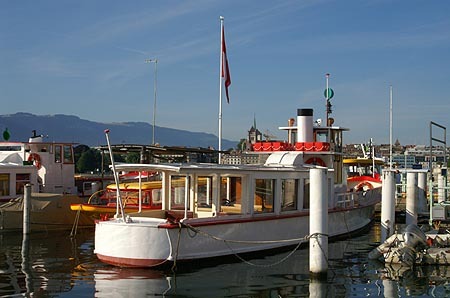 Additional 2005 images of Montreux are available on this link. Montreux arriving back at Lausanne-Ouchy after her afternoon Tour du Haut-Lac. Montreux leaving Yvoire for her evening return to Lausanne-Ouchy. Montreux departing from Ouchy on the 1230 to Evian, 14th July 2005. 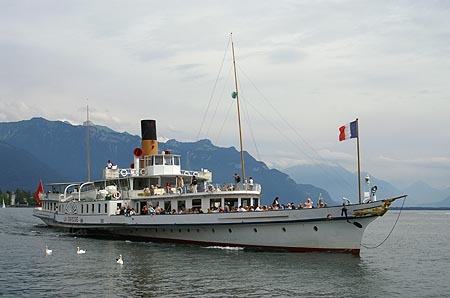 Vevey and sistership Italie were built in 1907 and 1908. They are 60 metre steamers which were fitted with diesel-electric installations in 1955 and 1958, subsequently proving to be very economical units in the fleet. 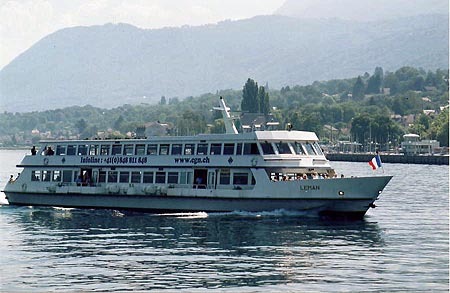 Vevey ran the Ouchy-Evian ferry service for much of the year until replaced by Léman (5) in 1991. On this service she maintained two crews and operated for about 20 hours each day. 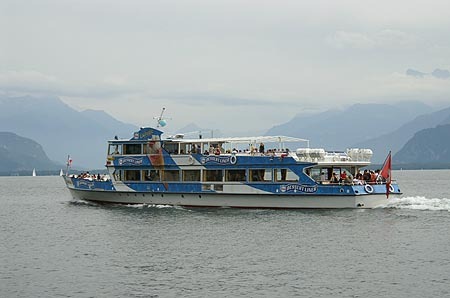 In the peak season of 2005, Vevey worked short cruises from Geneva, consisting of a lunch cruise, plus afternoon and evening cruises to Yvoire. 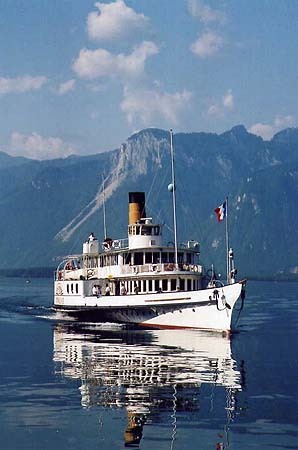 In 2006, Vevey may take over the Petite-Lac circulars currently run by Chablais. However, she is due to be withdrawn at the end of that season as a cost-saving measure. Additional 2005 images of Vevey are available on this link. 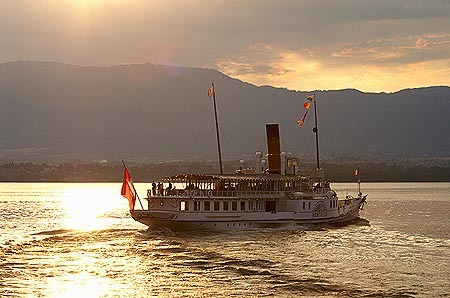 Vevey near Nyon on her evening cruise. 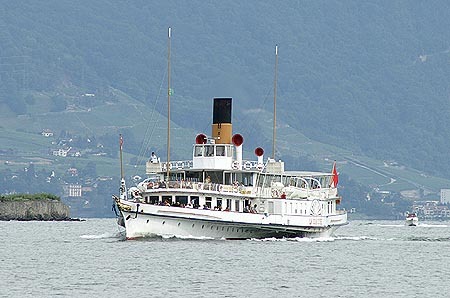 Vevey at Yvoire after arrival on 1840 ex-Geneva, 13th July 2005. 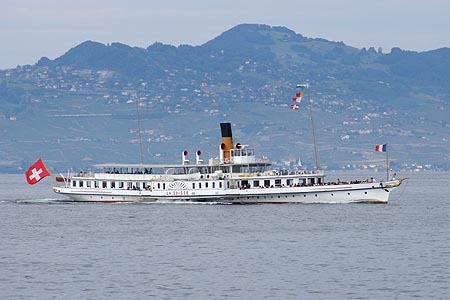 Vevey and sistership Italie were built in 1907 and 1908. They are 60 metre steamers which were fitted with diesel-electric installations in 1955 and 1958, subsequently proving to be very economical units in the fleet. 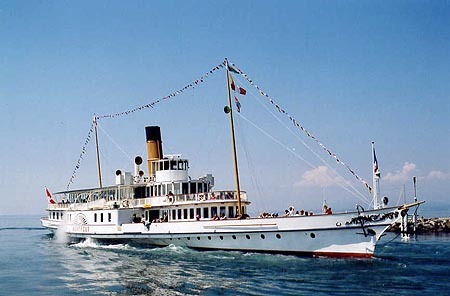 Italie has long been associated with the daily return from Le Bouveret to Geneva and back, taking almost 12 hours. This sevice will cease at the end of the 2005 season, replaced by shorter runs. Furthermore, Italie will be withdrawn as a cost-saving measure. Our early holidays on Lake Geneva were at Montreux and Vevey, and we travelled on Italie a lot since she was the first departure for Ouchy, and last return each day. Italie became a firm favourite in the CGN fleet, despite her (very smooth) diesel engine. It is a tragedy that such a beautiful ship needs to be withdrawn for cost reasons. It is planned that Vevey will also be withdrawn at the end of the 2006 season. Additional 2005 images of Italie are available on this link. Italie leaving Rolle for Yvoire, on her daily Le Bouveret-Geneva outward trip. Italie between Evian-les-Bains and Ouchy, on her daily Geneva-Le Bouveret return trip. Italie leaving Geneva Eaux-Vives, on her daily Le Bouveret-Geneva outward trip. 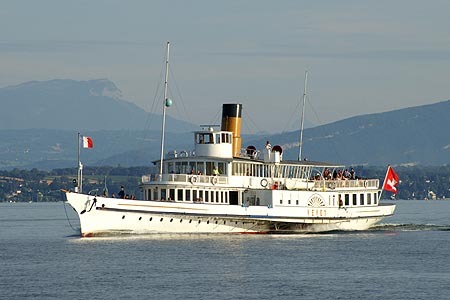 Italie arriving at Geneva, on her daily Le Bouveret-Geneva outward trip. 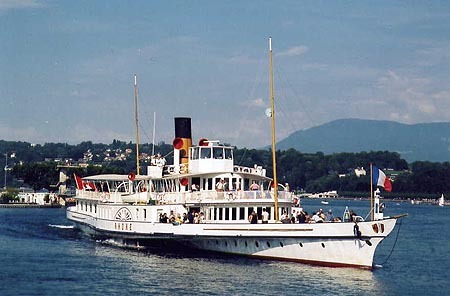 Italie leaving Yvoire on the 0850 ex St.Gingolph, 15th July 2005. Italie arriving Montreux on the 0850 ex-St.Gingolph, 15th July 2005. Italie on the 0850 ex-St.Gingolph, seen from Rhône off Rolle, 16th July 2005. 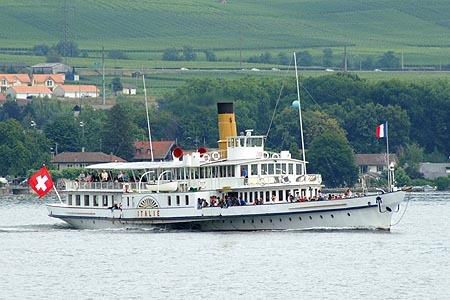 La Suisse (2) was the first of the trio of 70 metre steamers built for Lake Geneva. She was delivered in 1910, and carries 1200 passengers. She was always easily identifiable from the later giants, Simplon (3) and Helvétie (2), by having her boiler ahead of the paddlewheels. Adjusting the boiler's position on the later steamers provided a more spacious internal layout, allowing more passengers to be carried. 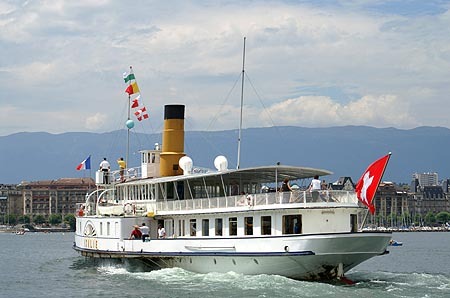 For many years La Suisse (2) had been used on the Ouchy-based lunchtime cruise to Evian and the afternoon Tour du Haut-Lac, both taken by the Montreux in 2005. 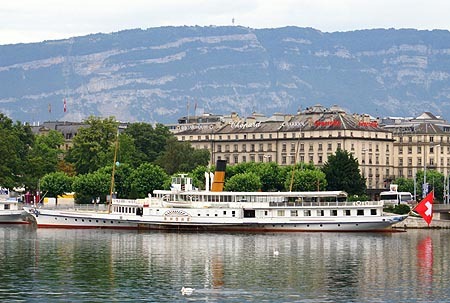 In more recent years, La Suisse (2) has returned to the early morning departure from Geneva to St Gingolph and back, a round trip of nearly 12 hours. This is now called the "Rhône Express". 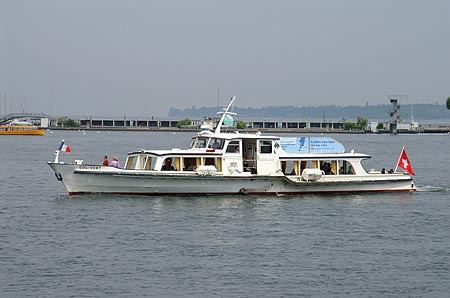 2005 was the last year of this service along the complete length of Lake Geneva. In 2006 La Suisse is scheduled to terminate at Vevey. Additional 2005 images of La Suisse (2) are available on this link. La Suisse (2) leaving Geneva Mont-Blanc for her daily "Rhône Express" Geneva-St Gingolph-Geneva circuit. La Suisse (2) arriving at Vevey on the return leg of her daily Geneva-St Gingolph-Geneva circuit. La Suisse (2) between Ouchy and Evian on the return leg of her daily Geneva-St Gingolph-Geneva circuit. La Suisse (2) arriving Nyon on 1430 ex-St.Gingolph, 14th July 2005. 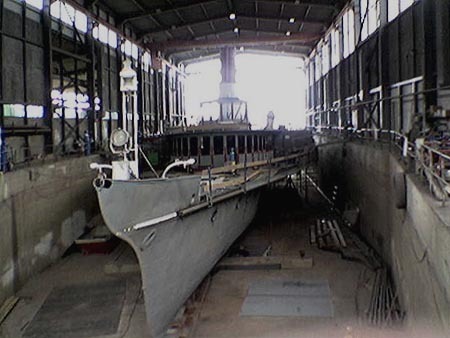 Savoie did not sail in 2005, since she is undergoing major reconstruction work. She is due to re-enter service in 2006. 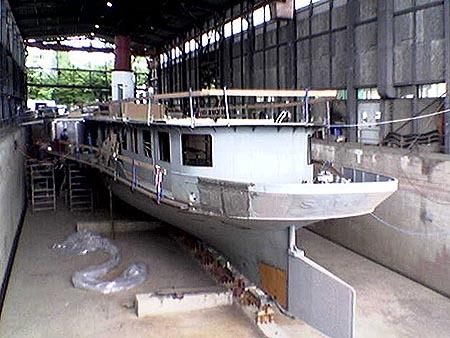 Savoie undergoing restoration at Ouchy in 2005. 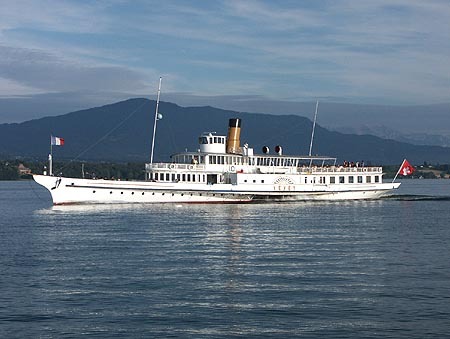 Simplon, the largest working paddle steamer on the Swiss lakes. 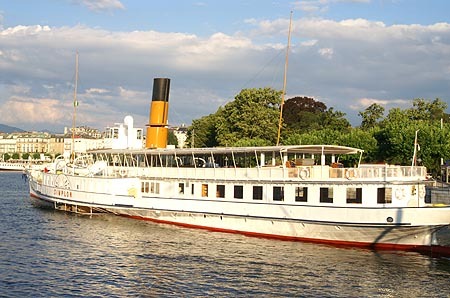 Completed in 1920, although started before the First War, she is 70m long and can carry 1500 passengers. A 1400hp 2-Cylinder compound steam engine can drive her at 29.5kph. 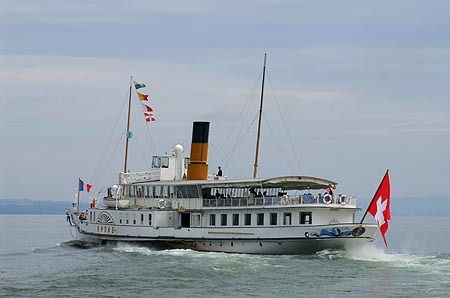 In recent years she has mainly been used as reserve ship, based at Lausanne-Ouchy, but saw greater use whilst the diesel paddler Montreux was rebuilt with new steam engines. In August 2003, she suffered an engine room pipe burst, but returned to service in July 2005, running opposite Rhône (3) in the peak summer on the two-day roster. Additional 2005 images of Simplon (3) are available on this link. Simplon departing Nyon on the 1015 Geneva to St.Gingolph on her first public trip following repairs, Sunday 17th July 2005. Simplon (3) at Geneva Jardin-Anglais. Simplon (3) leaving Geneva (Jardin-Anglais). 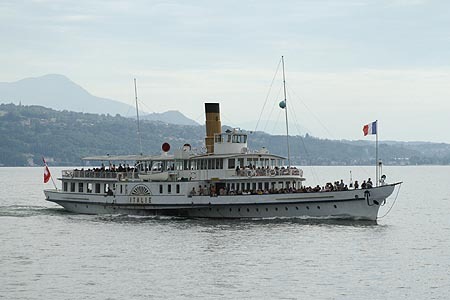 Helvétie (2) was built in 1926, the last of Lake Geneva's trio of 70 metre steamers. 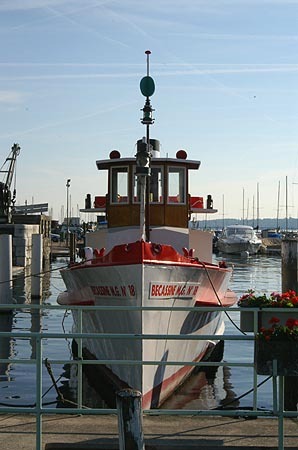 In 2004, Helvétie (2) was laid up at Lausanne-Ouchy awaiting a decision on replacement of her twin diesel engines, which had been removed from the Danube paddle tug Goliath. Unlike the other diesel-electric conversions by CGN, this arrangement was not a success. 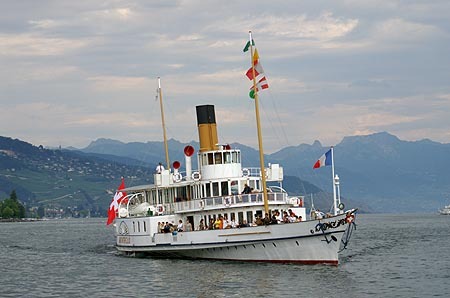 Initially used after conversion on the daily Geneva-St Gingolph-Geneva run, she was soon consigned to use on evening dinner cruises from Geneva to Yvoire a couple of times a week. Unlike the other conversions, noise and vibration are considerable at speed, although she did seem to be extremely fast when required to make up for delays. 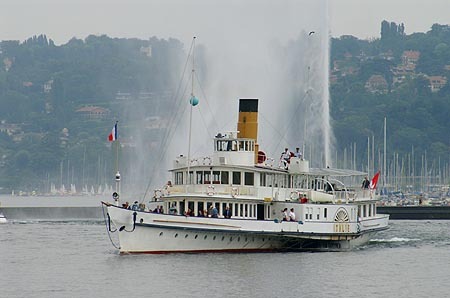 Her original steam engines are located in a museum at Nyon, and there were suggestions that they might be restored to her, although this now seems most unlikely. Helvétie (2) laid up at the CGN yard, Lausanne-Ouchy. 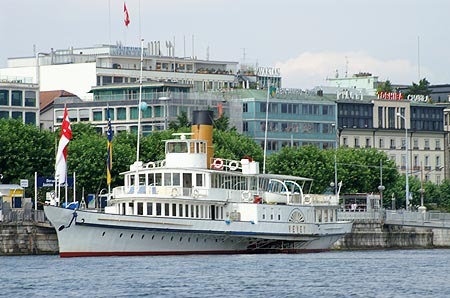 Rhône was built in 1927, the last paddle steamer built for CGN. Her 2-cylinder compound engine has hydraulically-driven valves and an automatic lubrication system which requires enclosed cranks. 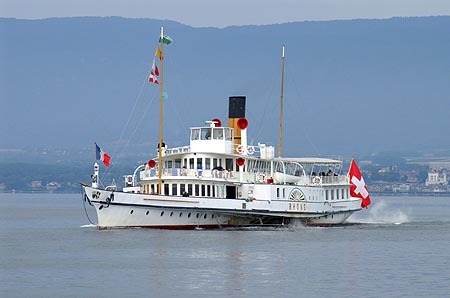 She previously worked the daily Geneva-St Gingolph-Geneva service opposite Italie, but now works one of the two-day rosters with Henry Dunant or, in peak season in 2005, with Simplon (3). This requires overnight stops in either Ouchy and Geneva, running alternately Geneva-Ouchy-St Gingolph-Ouchy, then Ouchy-St Gingolph-Ouchy-Geneva. Additional 2005 images of Rhône are available on this link. Rhône arriving at Lausanne-Ouchy from St Gingolph. 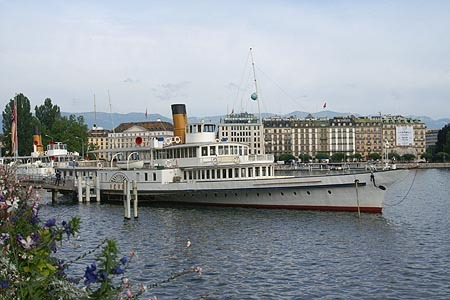 Rhône at Geneva Jardin-Anglais, prior to the day's services. Rhône arriving Geneva (Paquis) on the 1150 ex-St.Gingolph, 13th July 2005. 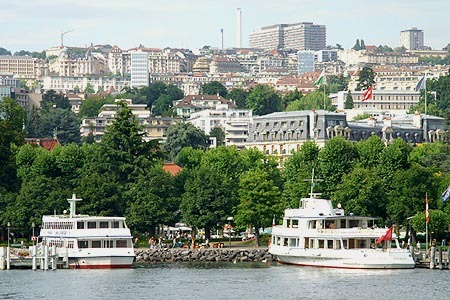 In 2005, Col-Vert operated short cruises out of Geneva. A complete history of Col-Vert starts on this link. Additional images of Col-Vert in 2005. 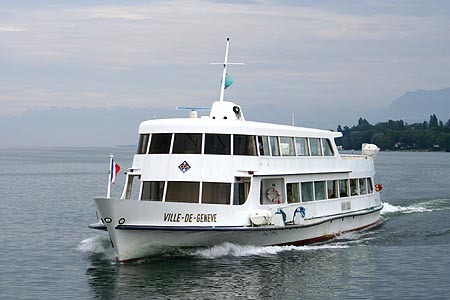 In 2005, Grèbe operated short ferry trips around Yvoire and Nyon. A complete history of Grèbe starts on this link. Additional images of Grèbe in 2005. 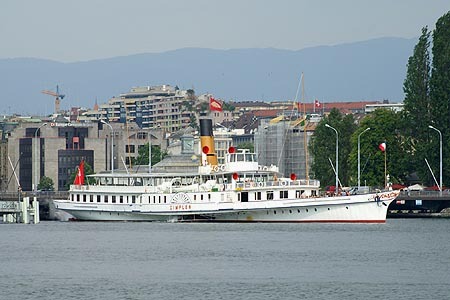 Bécassine is no longer part of the CGN fleet, but was owned by them between 1961-85. Since she remains active, working out of Geneva, I have included her for completeness. MG No.18 Bécassine (=Snipe), was built in 1931 for the Société des Mouettes Genevoises. 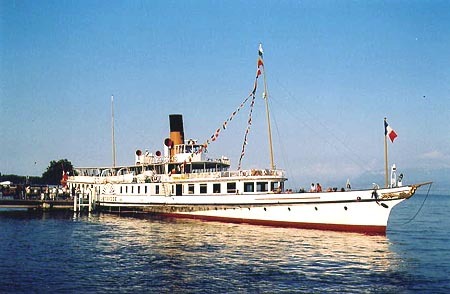 Between 1941-61 she worked on the Société des Lacs de Neuchâtel et Morat. 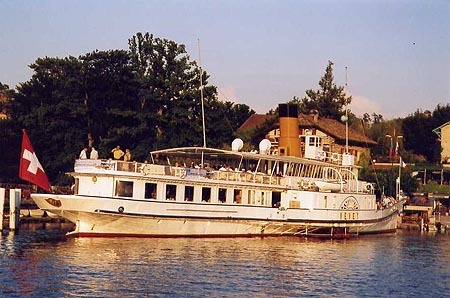 She was brought back to Lake Geneva to carry diplomats between Signal-de-Bougy to Evian during negotiations on the Algerian war of independence. 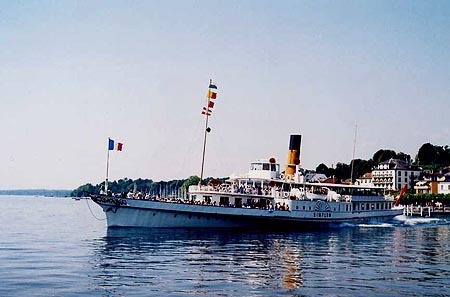 She was managed by CGN, although owned by the French state, and given the name Bécassine. After the conference, she was bought by CGN. She was used as a company work boat, and occasionally on services out of Ouchy. In 1985 she was sold back to her original owners, Société des Mouettes Genevoises, and now carries the name MG No.18 Bécassine. 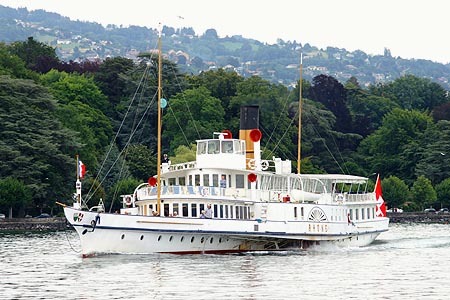 She is maintained in beautiful condition for circular trips from Geneva. Recently she was converted to battery power. The batteries are charged from solar panels both on the roof of the boat and also on shore at Eaux-Vives and Mont-Blanc. 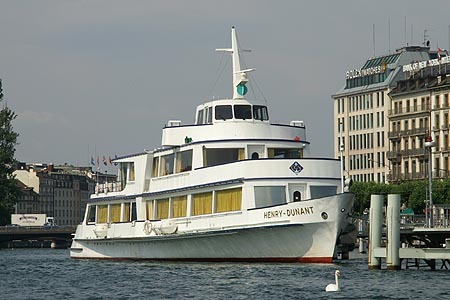 During the peak summer of 2005 (mid-July to Mid-August), Henry Dunant was kept as the spare and charter boat at Geneva. Outside this period, she operated one of the two-day rosters with the Rhône (3), but was displaced by the Simplon during the short height of the season. Additional images of Henry Dunant are available on this link. 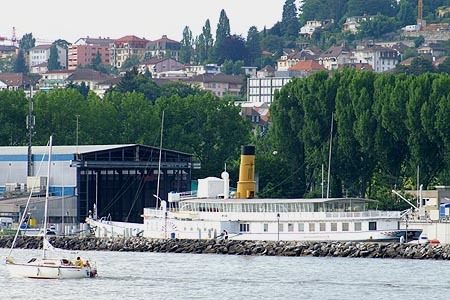 Henry Dunant laid up as spare ship at Geneva. 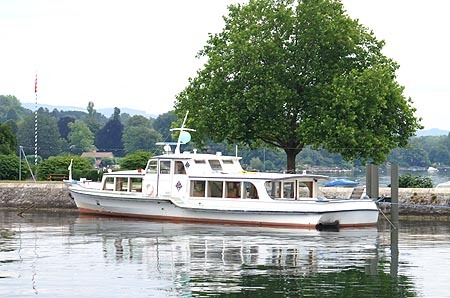 In 2005, Général Guisan operated a morning return trip to Geneva from Ouchy, followed by three evening returns to Evian, Evian/Thonon and Evian. 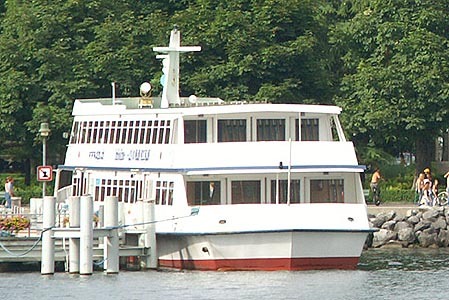 The Thonon trip is marketed as a dinner cruise. Additional 2005 images of Général Guisan are available on this link. Général Guisan arriving at Nyon. For many years, Chablais has operated on a circular route around the Haut-Lac Supérieur, between Le Bouveret-St Gingolph-Vevey-Montreux-Villeneuve-Le Bouveret and intermediate piers. She completed 5 circuits each day in 2005. Her blue livery is sponsored by an ice-cream company, and has changed since 2004. Additional 2005 images of Chablais are available on this link. 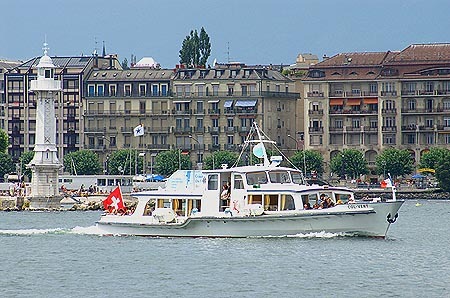 In 2005 Ville de Genève operated a series of ferry runs in the Nyon/Yvoire area. 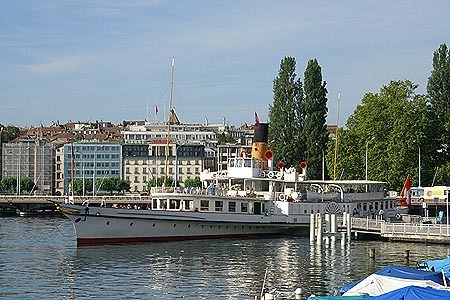 During the peak summer of 2004, Ville de Genève had been kept as the spare and charter boat at Ouchy (replaced by Lausanne in 2005). Additional 2005 images of Ville de Genève are available on this link. Ville de Genève near Nernier. Ville de Genève leaving Nernier. Ville de Genève at Yvoire Nernier. 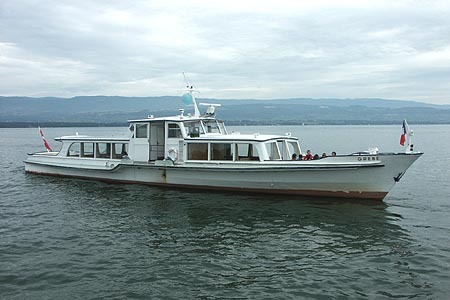 Léman (5) operates most of the ferry services between Evian and Ouchy. Many French people commute to Lausanne for work, and there is busy return traffic on market days in Evian. 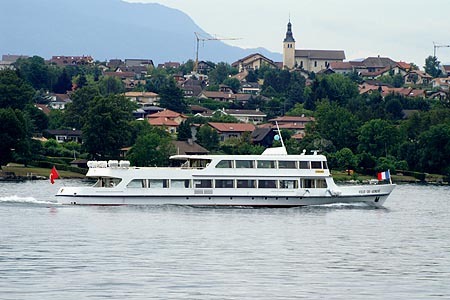 Léman (5) is easily the easily attractive CGN vessel to travel on, with functional plastic seating, little open deck space, and no difference between classes. 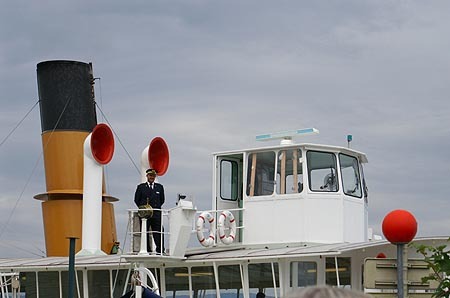 Whilst accepting the need for a warm enclosed ferry in winter, surely some of the side panels could have been made removable during the hot summer months. Additional images of Léman (5) are available on this link. Léman (5) and Général Guisan at Lausanne-Ouchy. 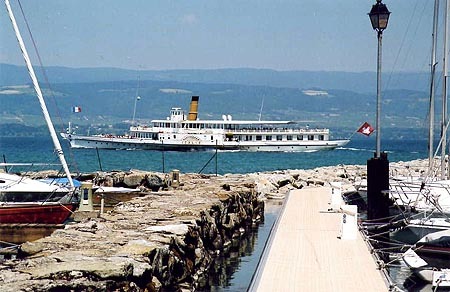 2005 photograph of Léman (5) at Evian. Photo: &COPY; Mike Tedstone, July 2005. Lausanne (2) is an impressively large ship with three full decks. 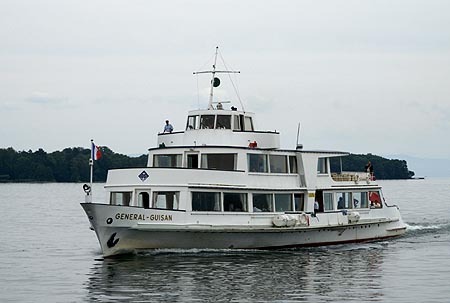 In peak summer she runs three cruises out of Geneva each day, those at lunchtime and the evening being marketed as gastronomic cruises with excellent food served on the top deck. 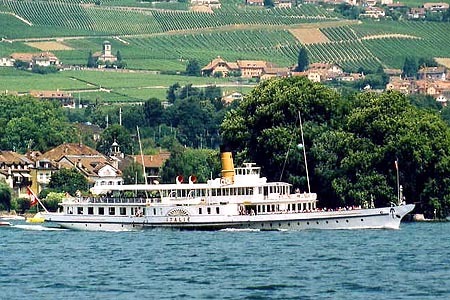 When first built, she was tried on the Geneva-St Gingolph-Geneva "Rhône Express", but now seems to see little regular use outside of the peak season, when her cruises are taken by the Vevey. Additional images of Lausanne (2) are available on this link.